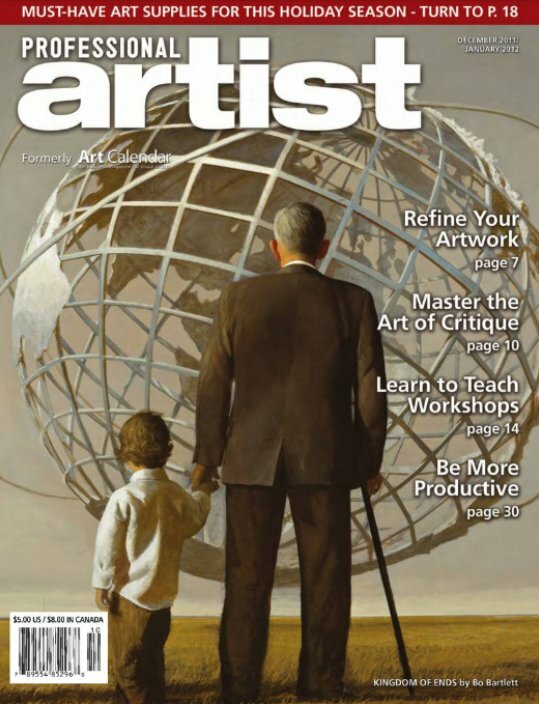 I’m excited to announce that I’m currently featured in Professional Artist Magazine (formerly Art Calendar Magazine) as part of their December/January issue. The article is titled “Communicating Social Messages through Art, Partnership and Publicity” and was written by Renee Phillips, aka The Artrepreneur Coach. I am honored to be a featured artist and to have had the opportunity to share some insight in this article. If you’ve been following my work, you know that art is my passion but reaching people through my work is also incredibly important. I strive to inspire others as well as get them thinking, talking, and acting upon issues that are of personal as well as social importance. In addition, Renee makes a great point that it is up to the artists, no matter what their subject matter, to be proactive about getting their work out there. I strongly agree and if you’ve checked out my previous posts on press releases, you understand why. I can’t post the actual article but if you would like to read a modified version of it, you can check it out on Renee’s site at www.manhattanarts.com/readingroom/ezine/CareerBusiness/Renee_Social-Issues.htm. 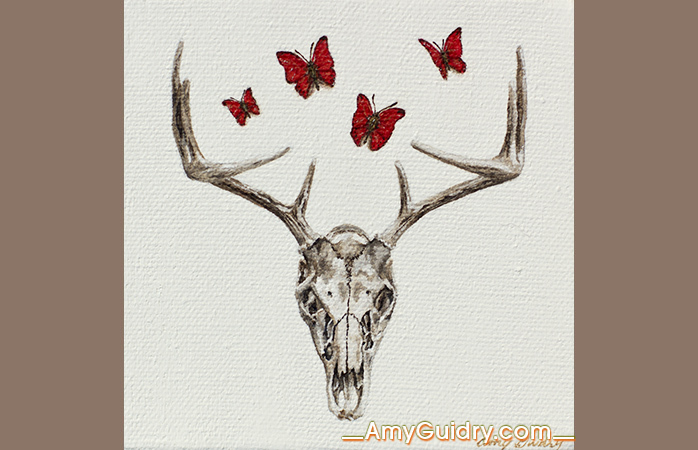 If you’d like to view my latest work and news, sign up for my monthly newsletter at www.amyguidry.com/contact.html and “like” my Facebook Fan Page for my updates. I’m excited to announce the “arrival” of my new video project featuring In Our Veins. This latest video is an in-depth look into the series, discussing my thoughts behind several paintings, as well as some great closeup views of the work. The video is narrated by Cheryl Mack (she also narrated the New Realm video- many people have asked if it was me). My description does not do it justice- so be sure to check it out by clicking the image below or visiting Youtube at http://youtu.be/raQXeTBHJTQ. To receive my monthly newsletter featuring new work, events, interviews and more, sign up at www.amyguidry.com/contact.html and you can also “like” my Facebook Fan Page to get my latest updates. 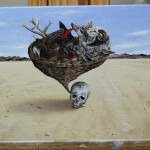 After much digging through photos and picking the “best” ones to post, I am finally posting one of my latest paintings. 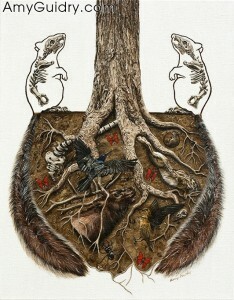 This is another addition to my In Our Veins series titled Cornucopia. (Totally a coincidence on the timing, given it is the week of Thanksgiving.) It is an acrylic on canvas, 10″ wide by 8″ high and is available through Wally Workman Gallery in Austin, TX. 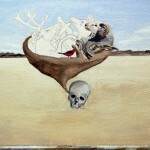 I’ve documented my painting during my process and have a few photos to share. I apologize for the poor quality except for the very last photo- which was professionally done. I’m not the best with a digital camera, but feel that these photos still get the point across. Just click the images below for a larger view. 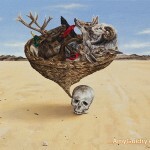 For my latest work and news, sign up for my newsletter at www.amyguidry.com/contact.html and “like” my Facebook Fan Page. I’ve just added two new paintings to the In Our Veins series- one of which I will post later since I’ll be including photos from my actual painting process, so be on the lookout. 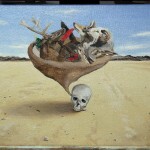 The other is a small painting, 4″ x 4,” acrylic on canvas, titled Untitled (Deer). These small paintings are pretty popular in that they sell almost immediately. 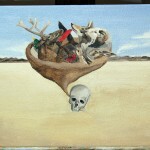 Which is why I am posting a new piece that is already sold. I will be adding more at this size, in addition to a variety of sizes, but I give my subscribers the first viewing. So if you would like the opportunity to see my latest work and purchase it while it’s still available, please sign up for my newsletter. 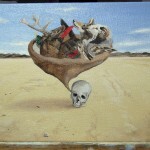 Facebook posts have a short shelf-life, as do Twitter, so this latest painting sold before anyone even knew about it. The newsletter is monthly and also gives a concise list of where I’m exhibiting at the moment as well as other news. You can sign up at www.amyguidry.com/contact.html (just click on the “newsletter” icon). Another painting from my New Realm series has found a new home. 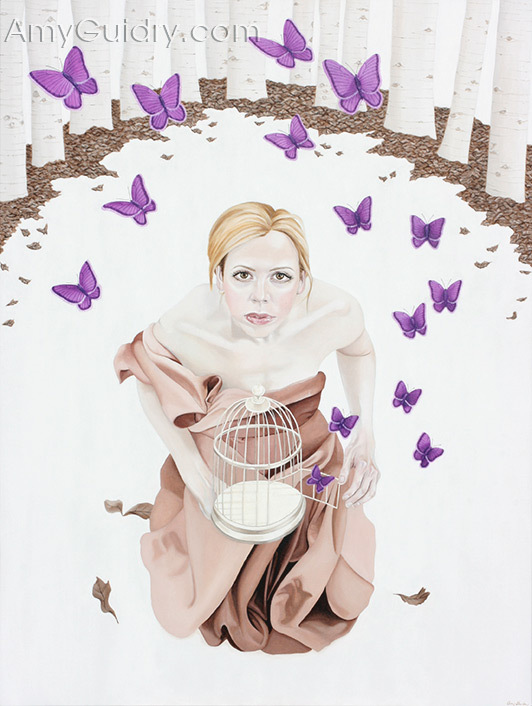 The painting is titled Release and was done in 2008. 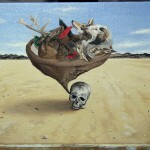 It is an acrylic on canvas, 36″ wide by 48″ high. This is a popular painting from the series and one of the more substantially sized ones. The new owners were particularly moved by this piece and likewise, I was moved by the significance this painting had for them. I won’t go into any details here because it is a personal story and will remain so. However, it just goes to show that it truly does not matter if you are not an artist or an art historian in order to appreciate art. I would never deny someone their feelings towards a piece because those feelings are based on personal experiences and memories that I know nothing about. Sure, I have my own thoughts, feelings, and reasons behind my paintings, but that doesn’t make them any more “legit” than those of others. The same could be said for books, poetry, music, movies, and so on. I was truly touched by what these new collectors had to say, and appreciated that they shared something so personal with me. Their story has actually added to my own story behind the work. 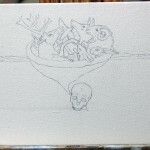 I enjoy telling stories through my art, but I love to hear the stories that others have to tell as well. Sign up for my monthly newsletter at www.amyguidry.com/contact.html. “Like” my Facebook Fan Page to get my latest updates. Sign up for my monthly newsletter for my latest paintings, exhibits, and news at www.amyguidry.com/contact.html. Follow my updates on my Facebook Fan Page. I recently did an interview for Eclectix with Patricia Zemanek and it is now online! 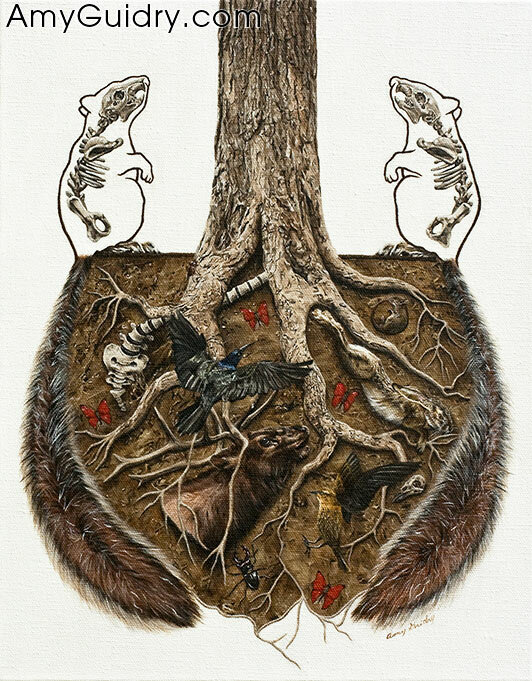 This coincides with their “Bad to the Bone” Volume 10 issue in which my work is also featured among some great artists, including a personal fave- Laurie Lipton. To read the interview, go to: http://eclectixetc.wordpress.com/2011/11/09/amy-guidry-eclectix-interview-26/. To view my new work and a list of upcoming exhibits, sign up for my monthly newsletter at www.amyguidry.com/contact.html. You can also “like” my Facebook Fan Page to get my latest updates. I recently attended the debut of the Billboard Art Project’s Baton Rouge, Louisiana exhibition in which I was a featured artist. There were 58 artists featured from around the United States, some of which were from Louisiana. It’s rather exciting to see one’s work projected on an LED digital billboard and attracting the attention of passersby is even better. While I was there, I had the opportunity to give an interview for the Billboard Art Project. The project’s creator, David Morrison, had flown in from Virginia for the event and conducted the interview. Check out the video by clicking the image below or go to YouTube at www.youtube.com/watch?v=vM4kmpOUW9U.